Though it previously retailed for $599, the Verizon version of the Samsung Galaxy Tab can now be purchased from Best Buy without a contract for just $499. 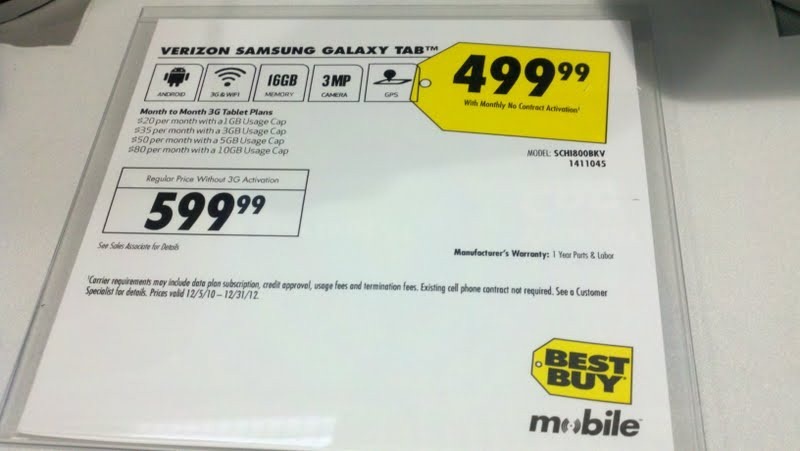 The price drop may be an indication that the WiFi-only Galaxy Tab could retail for much less. The new price also puts the Galaxy Tab in direct competition with the cheapest Apple iPad (16GB, WiFi-only), which also retails for $499. After purchasing the device and signing up for a plan, you must commit to it for at least a month before you are allowed to cancel the contract. Still, it's a decent deal - enjoy!